From the smallest of pueblos to the mega metropolis of Mexico City, most every town and city has a street named 20 de noviembre, including Oaxaca. In addition, Oaxaca has a 20 de noviembre market, where you will find Conchita, my favorite chocolate store, Pasillo de Humo (hall of smoke/grilled meats), aisles of stalls filled with bread, and lines of counters offering menudo and other traditional street food — a very popular destination for locals and adventurous tourists. To highlight a Oaxaca connection, today’s NVI Noticias published the article, Enciende Madero mecha revolucionaria; Visita Oaxaca en 1909, about Francisco I. Madero’s visit to Oaxaca to light the fuse of revolution in this remote state. 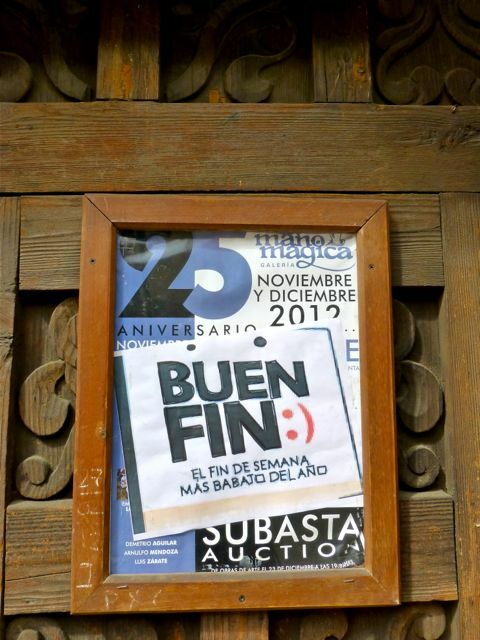 By the way, in 2005, Article 74 of Mexican labor law established the third Monday of November as the “official” holiday — thus following the USA’s “time-honored tradition” of creating 3-day holiday weekends and setting the stage for the bargain hunting shopping extravaganza promoted as Buen Fin. I’d only glanced and didn’t come close enough to read the smaller and more important print, “Weekend: Cheapest of the Year.” What’s it all about? Last year’s LA Times article, “A ‘Black Friday’ shopping ritual coming to Mexico?” explains it all.